Tags: Descendants / Disney Channel / Disney Cruise Line / Disney Descendants / Disney on Wheels / Disney Villains / Hades / Review / Villains Tonight! As the debut of the Disney Channel original Descendants is fast approaching, I thought it would be fun to take a look at how Disney Cruise Line incorporates villains into its ships. Disney Cruise Line (DCL) may be ‘Disney’ themed, but it is not overly ‘Disney’. One has to look for the hidden characters in the décor to really appreciate the Imagineers and how they have subtly incorporated the characters. Yet, being a Gold Castaway Club member (I have been on 9 DCL cruises and on all 4 ships) I have yet to see a villain in the ships décor, it seems to focus on Mickey, Minnie, Donald, Goofy, Pluto and other “nice” characters. So are there villains on board a DCL ship? Yes, if you look for them. But, they are not the main focus like the “Fab 5”. 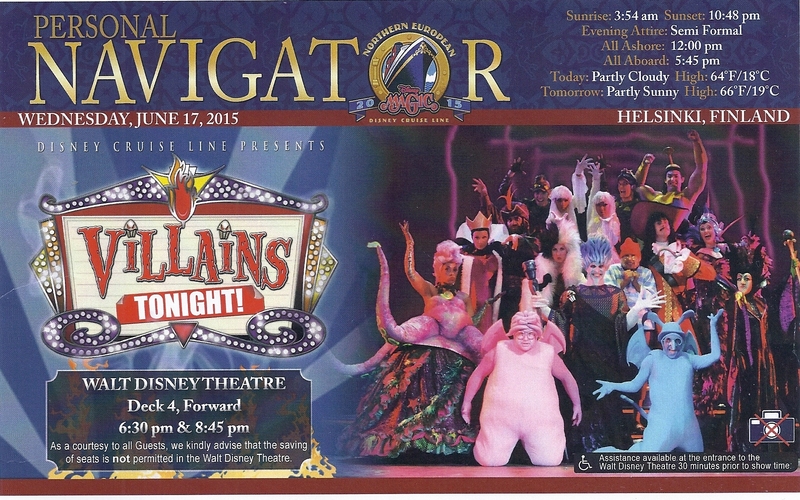 In fact DCL has not forgotten about the villains – they actually have a stage show of their own called Villains Tonight! 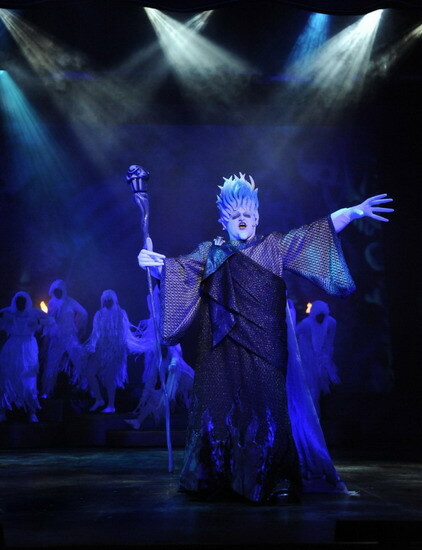 The stage shows on DCL are Broadway-type shows with elaborate costumes and sets, special and pyrotechnical effects. 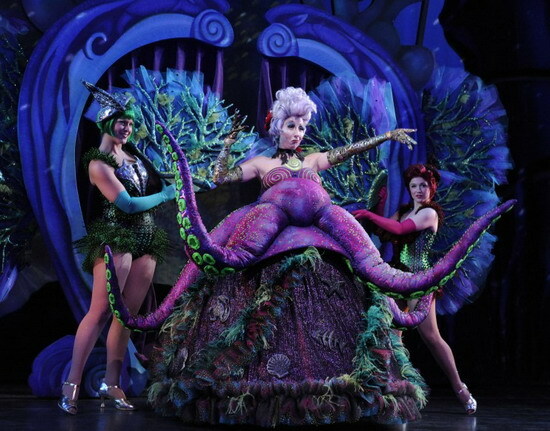 The show was designed to be family-friendly and is not scary, even with villains running up and down the aisles. Currently Villains Tonight! is showing only on the Magic and Dream ships in the Walt Disney Theatre, or if you do not want to leave your cabin, you can watch it on your stateroom TV. Now that’s a list of villains I would not want to run into unless they were in this show. As I mentioned earlier, I do not want to give too much away, but in the end Hades remains the “Lord of the Underworld”. Oops, gave it away! 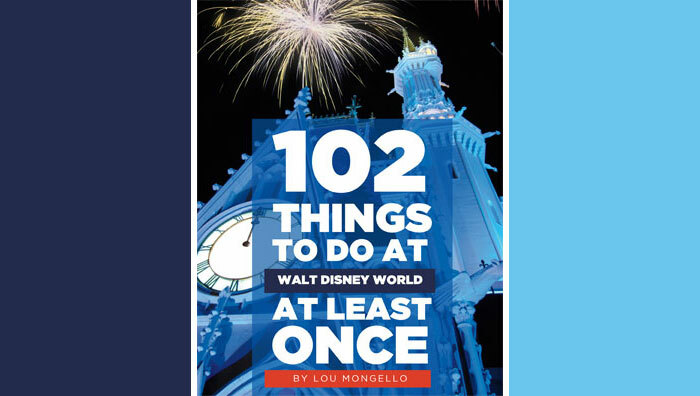 The show is about an hour long, but fast paced with songs and special effects to keep you sitting on the edge of your seat. I highly recommend seeing this show if you are lucky enough to be aboard the Magic or Dream. I’ve seen it several times, and they do a good job of updating the jokes that Hades and the cast of characters use, so it keeps it fresh. Besides Villains Tonight!, it is rare to see villains at Meet & Greets on non-Halloween on the High Seas cruises. During most cruises there is a Pirate Night and that is the day you will see Captain Hook at a Meet & Greet. (Pirate Night is worth a post of its own.) On my last cruise I did see some of the secondary stage characters from Villains Tonight! in the atrium area during the Till We Meet Again party. They were not part of the show; they were just hanging around on the second level. This farewell party is on the last night of the cruise. A Disney Villains Quote Trivia contest also took place on the same day as the Villains Tonight! show. The contest tests your knowledge of which villain said certain lines and from what movie. Fun! This article contains information from a cruise in June 2015 and the comments/review is the authors personal opinion. Other villain appearances may take place on different cruises or times of the year (Halloween) which were not discussed in this article. Andrew is a 17-year-old senior in high school from Ohio. He was born with cerebral palsy and gets around in a wheelchair. 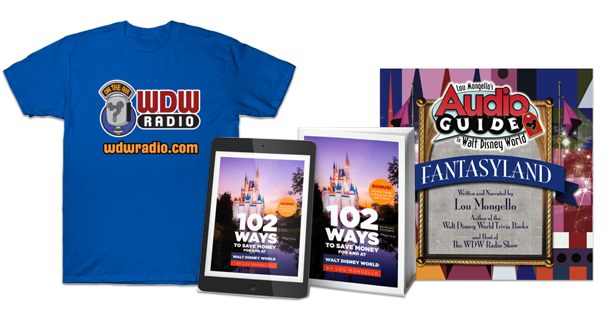 He has been to both US Disney parks, several D23 events and is a DCL gold Castaway Club member. If you would like to contact him feel free to e-mail him at arprince@bex.net or look him up on Facebook and on Twitter. Tags: Descendants Disney Channel Disney Cruise Line Disney Descendants Disney on Wheels Disney Villains Hades Review Villains Tonight! We also saw a lot of kids running in the hayllaws on our Disney Cruise last year. My kids saw them running and wanted to run to, but I wouldn’t let them. It is hard to get your kids to have good manners when they see other kids running wild. We were on Deck 5 with a magical porthole, and our room was in one of the extra little hayllaws, so our room was not noisey.